Coppell Gifted Association is excited to offer our ninth summer of local enrichment courses as a service to students entering grades 4-8 in the fall of 2016 with proceeds to be used for educator training in gifted instruction. 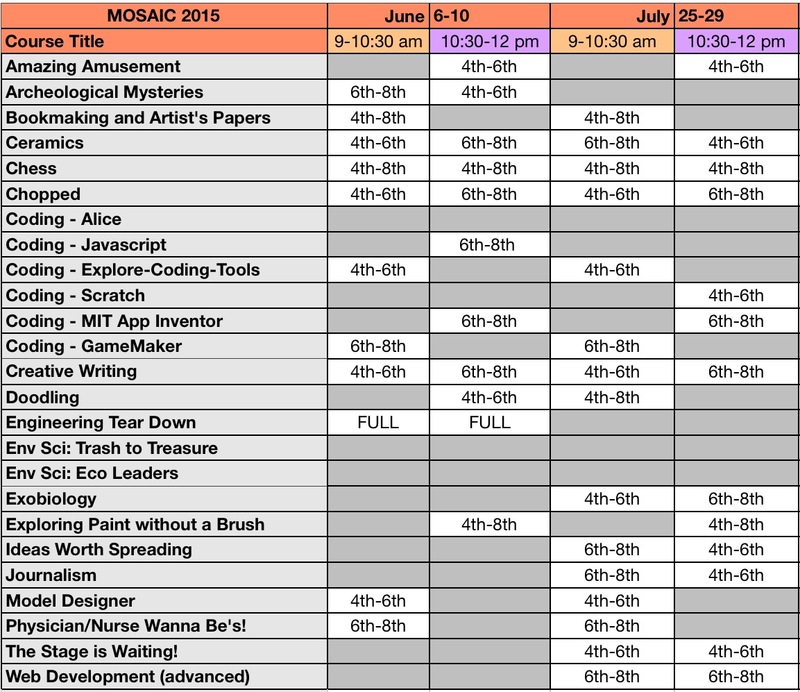 MOSAIC (Marvelous Opportunities Scheduled as Individual Courses) is scheduled during the weeks of June 6th – 10th, 2016 and July 25th-29th, 2016 from 9:00 a.m. – noon. More than 20 courses will be offered this summer. Courses are for kids who want to explore the subject matter more deeply and are not limited to gifted students. MOSAIC is being taught by CISD teachers or other subject matter professionals and held at Coppell Middle School North. See below for details. CGA Members – $90 one course, $155 two courses (for same student in the same week) plus any materials fees. AFTER FEB 22: Non-members – $105 one course, $185 two courses (for same student in the same week) plus any material fees. After registering, you will receive a registration code and payment information. Then, you can Pay online by clicking here or by check.